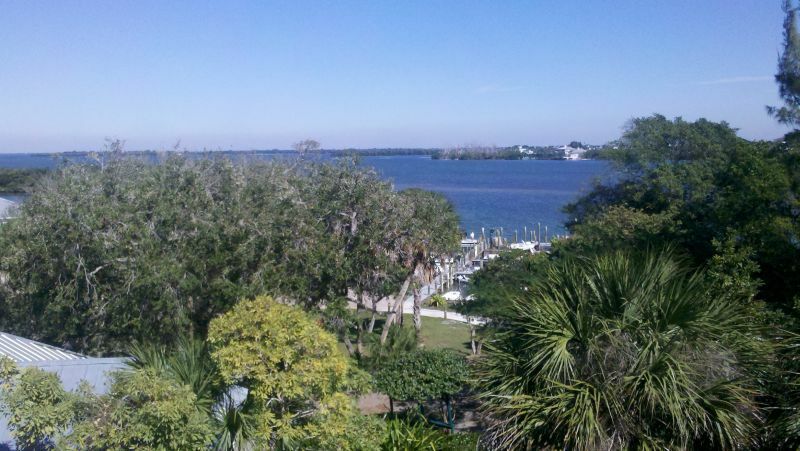 Pine Island Sound — the area bordered by Fort Myers, Sanibel, Captiva and Pine Islands — has climbed to our number two favorite place after Canada, just ahead of Kentucky Lake. What development there is (outside Cape Coral and Fort Myers) is low key, the beaches are pristine, and the sound is totally protected by the islands, so it’s never rough. 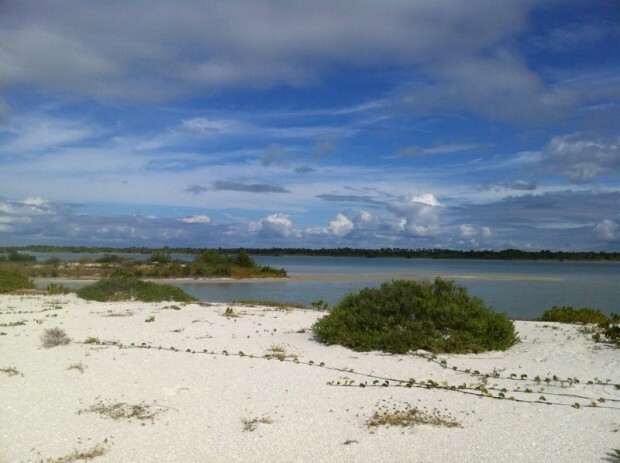 Then onto one of the most famous of the Pine Island anchorages, Pelican Bay at Cayo Costa State Park — only accessible by boat, protected, and a huge beach and tropical nature trails. It was a cool Monday, so we had the beach to ourselves, but a fair number number of boats were just vegging out in the anchorage. Then onto another well-known spot, the anchorage at Useppa Island across from the Cabbage Key Inn. We dinghied over for lunch (again, boat-accessbile only) and it was great. They let you climb up the water tower and you can see for miles. 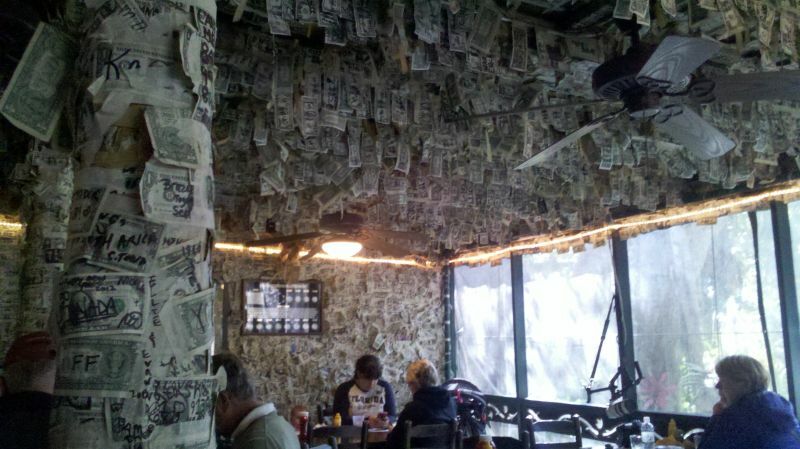 Cabbage Key’s famous gimmick is that the whole restaurant is plastered with dollar bills. 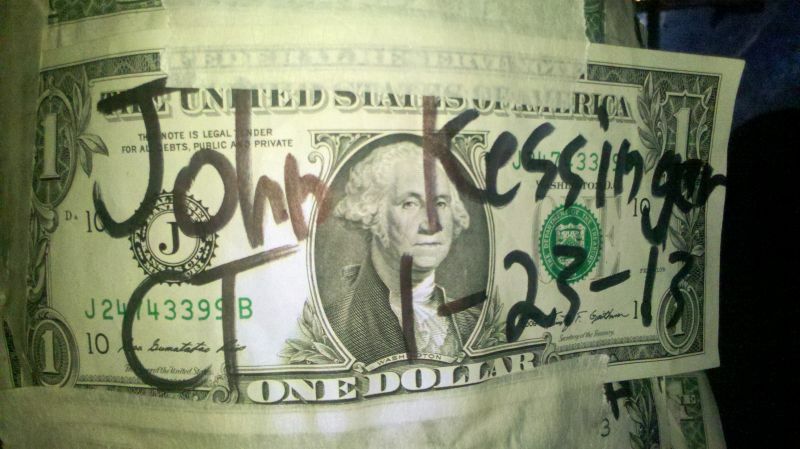 Legend has it that the tarpon fishermen who were the inn’s initial guests used to put their name on a bill and pin it up, so after a day of fishing, drinking and gambling, they’d always have a buck for one last beer. 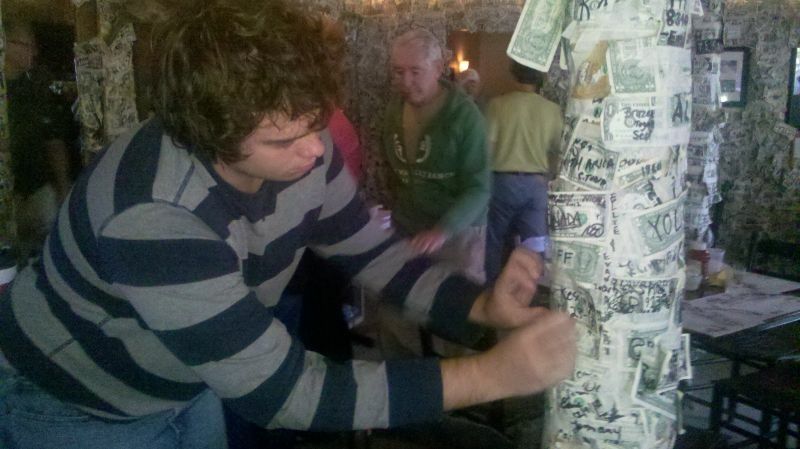 Molly and I went there year’s ago while staying at South Seas plantation, but I couldn’t find our dollar among the 80,000. 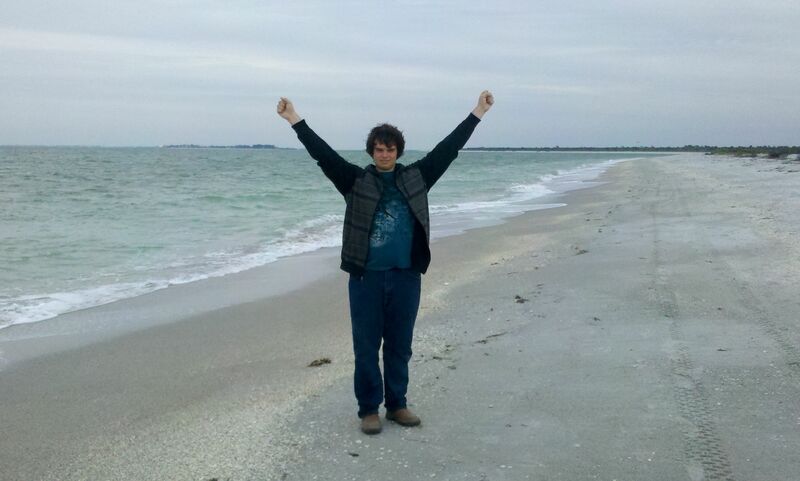 Then on to Captiva Island, which deserves its own entry. 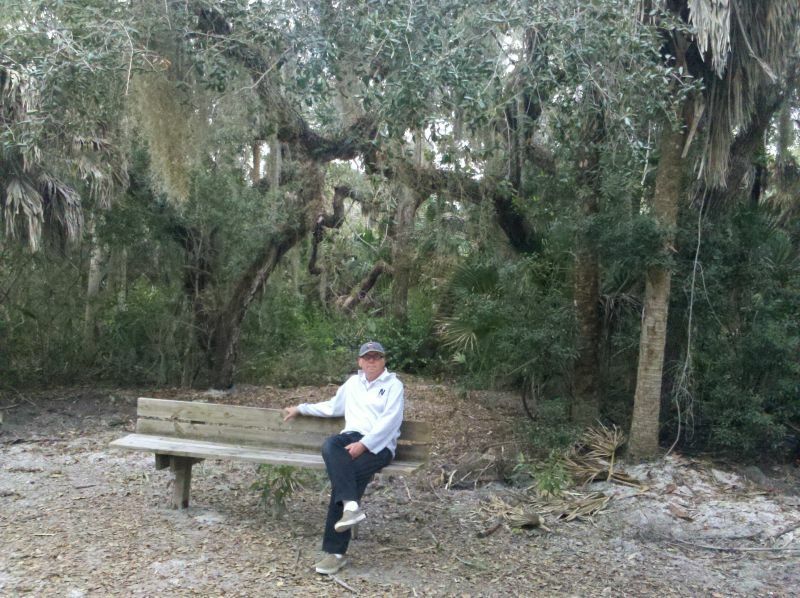 If I am ever afflicted by religion, I won’t ask to go to heaven, just back to Captiva. You’re killing me! I have serious cruising envy. Still cold in CT with ice storm predicted for tomorrow.